The revelation in this morning’s Apple Daily that, from 1 June this year, all Government Policy Committee papers and submissions to the Executive Council must include ‘an assessment on Mainland reaction and related public relations’ should set alarm bells ringing. Under ‘one country, two systems’ there is no reason why Hong Kong’s policy makers should be constantly looking over their shoulder, trying to second guess possible Mainland reaction to proposals that fall squarely within the SAR’s high degree of autonomy. Apart from the objections in principle, one is forced to ask how such an assessment will be formulated, who will be consulted and how much influence their views will bring to bear on the policy proposals in question. As the last Chief Secretary under British administration, I can confirm that there was never such a mandatory requirement to assess possible UK reaction to domestic policy issues, even when – as happened from time to time – these had significant implications for UK commercial interests. In those days, I and my colleagues understood very clearly that our first responsibility was to develop and implement policies that were in the best interests of the Hong Kong community. 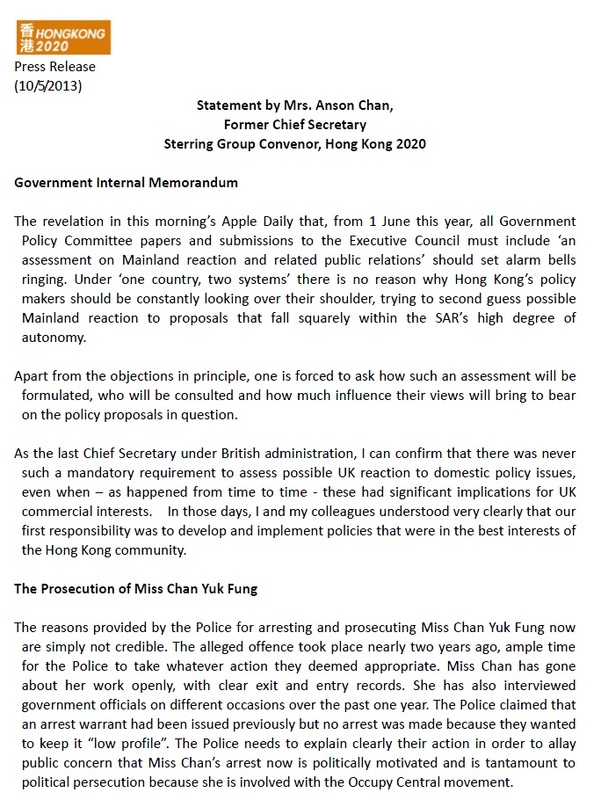 The reasons provided by the Police for arresting and prosecuting Miss Chan Yuk Fung now are simply not credible. The alleged offence took place nearly two years ago, ample time for the Police to take whatever action they deemed appropriate. Miss Chan has gone about her work openly, with clear exit and entry records. She has also interviewed government officials on different occasions over the past one year. The Police claimed that an arrest warrant had been issued previously but no arrest was made because they wanted to keep it “low profile”. The Police needs to explain clearly their action in order to allay public concern that Miss Chan’s arrest now is politically motivated and is tantamount to political persecution because she is involved with the Occupy Central movement.